Provinces, SANA-The army continued on Sunday its large-scale operations against terrorist organizations in different provinces where it killed more than 35 ISIS terrorists in the eastern area and destroyed their weapons and vehicles. An army unit carried out a pre-emptive operation against terrorists of “the Islamic State in Iraq and al-Sham” (ISIS), who tended to infiltrate into safe areas from al-Ommal neighborhood in Deir-Ezzor city, Killing 20 of the terrorists and destroying their weapons. A military source told SANA that another army unit destroyed an ISIS terrorists’ den in the fields of al-Morei’ia to the eastern countryside of the eastern province, killing 15 terrorists including Abu Usama al-Tunisi, in addition to other Chechen terrorists. An army unit killed 24 ISIS terrorists in al-Matar al-Qadim neighborhood in Deir Ezzor. Many identical reports indicated that ISIS terrorist organization liquidated more than 200 of its mercenaries, most of them Chechens in charges of a defection bid, throwing their bodies in al-Houta area in the countryside of Raqqa province. A field source told SANA Sunday that the army unit clashed with the ISIS terrorists following the explosion of the car, killing a number of ISIS and destroying their weapons and ammunition. 16 members of Takfiri terrorist organizations affiliated to the so-called Jaish al-Fateh were killed in the southeastern countryside of Idleb province according to field sources. The sources told SANA Sunday that an army unit, by four special operations, targeted the positions and hideouts of the so-called al-Itehad al-Islami of Ajnad al-Sham in al- Tamana town , about 65 km southeast of Idleb city, killing 16 terrorists, among them Anas al-Bakri, Mohammad Izz-Eddin al-Bakri, Khaled Ahmad al-Sousi and Mohammad al- Tafran. Army units thwarted a terrorist attack launched by terrorist groups belonging to the so called ”Jaish al-Fatah” against a number of residential gatherings in al-Skeilbia countryside to the northwest of Hama city. The army units in cooperation with popular defense groups clashed with large numbers of terrorists who assaulted from the four axes in the area around Tel Hawash, al-Qabo, al-Baneh Tel al-Sakhr to the north of Kafr Nabbudah town. Dozens of terrorists were killed or injured during the clashes while others fled away, the sources added. The army air force targeted terrorists’ hideouts and concentrations in Ateiq al-Bajera, al-Jadida, Dahash, Umm Ummayyah, Jabala, Kifr Mouda, Tal Ais, Kifr Zeita and all-Salamyeh, killing dozens of terrorists and destroying their vehicles and weaponry. Army units targeted ISIS concentrations on Palmyra-al-Bayarat road and on Ein Hassein road in Homs eastern countryside, killing scores of terrorists and destroying a number of vehicles equipped with machineguns. An army unit killed and injured all members of terrorist groups affiliated to “Ahrar al-Sham” terrorist organization in Talbeseh in the province’s northern countryside. Army units established control over Ghamam village and mountain in the northern countryside of Lattakia. 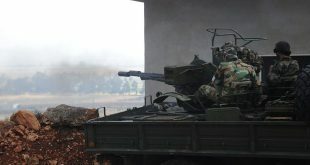 Army units, in cooperation with popular defense groups, established control over Ghamam village and mountain, eliminated all terrorists’ positions in the area and continued moving forward in the northern countryside of Lattakia. 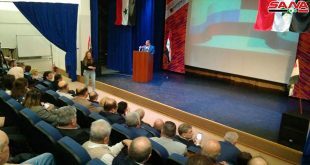 Army units adopted military tactics commensurate with the nature of the area which terrorist organizations were using as a base to launch their rocket attacks against Lattakia. 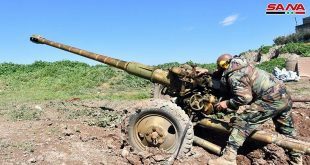 An army unit, in cooperation with the popular defense groups, targeted terrorist organizations’ gatherings and dens in Kherbet al-Ghoutha in the southwestern countryside of Sweida province, a military source told SANA on Sunday. A number of terrorists were killed and their heavy machineguns- equipped vehicles were destroyed in the army operations. Army units launched strikes against ISIS terrorists east of al-Rashida village which is located east of Sweida city. The strikes resulted in the destruction of vehicles equipped with heavy machineguns and ammunition, wounding a number of ISIS terrorists. Later on the day, the army targeted terrorists in Kherbat Saad and al-Qasr, killing a number of them and destroying their weapons and ammunition. 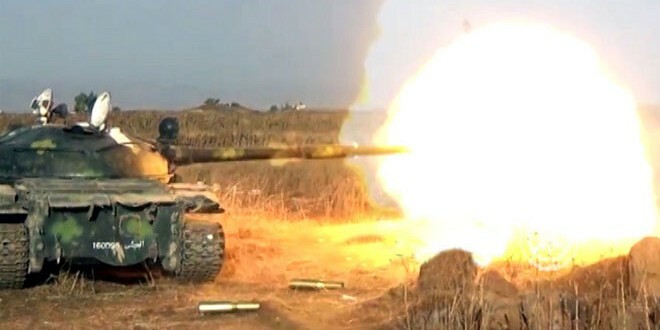 An army unit launched concentrated strikes against terrorists’ dens in Daraa al-Balad. The strikes resulted in destroying a terrorists’ den with all terrorists inside it in al-Nazihin Camp in Daraa al-Balad. Terrorists from Jabhat al-Nusra were killed and others injured in army’s strikes in Sahwet al-Qameh village east of Daraa city. 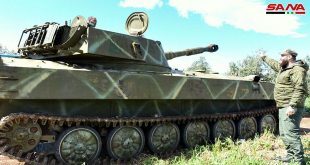 An army unit targeted convoy of vehicles in Daraa al-Mahatta, destroying many of the vehicles and killing a number of terrorists. Terrorist organizations acknowledged on their pages on social media sites the death of many of their members, including Naji Mohamed Abu al-Sil, the leader of the so called “Soqour al-Islam Battalion”. An army unit ambushed a terrorist group belonging to the Islamic State in Iraq and Syria (ISIS) on the road between al-Rahmania and al-Taana to the northeast of Aleppo city. Field source told SANA that the ambush targeted one of the most dangerous supply routes of ISIS in the northeast of Aleppo countryside, killing dozens of terrorists. A number of explosive devices, containing C4 substance, were seized by army in addition to many of communication devices. Later on the day, the army targeted ISIS concentrations and vehicles near the air force academy and to the east of al-Sfeira, killing scores of terrorists and destroying a number of their vehicles. The army also targeted terrorists’ hideouts in Hreitan, al-Shamir and Talat al-Shawaya in Aleppo northern and east-northern countryside. Army units targeted terrorists’ gatherings in the neighborhoods of Karm Maysar, Qadi Askar and al-Mallah in Aleppo city and killed and injured a number of terrorists and destroyed their weapons and ammunition. The army also attacked terrorists in Khan Tuman, al-Hader, Kifr Halab, Khalsah, al-Sheikh Ahmad, al-Muqbila, al0-Muflisa and Deir Hafer, inflicting heavy losses upon terrorists and obliterating their hideouts and gatherings.